James Madison University Students Spend Spring Break at Sheffield Place! Sheffield Place is so much more than just a home for mothers and their children. It's the beginning of the rest of their lives. I am so impressed by all of the services it has to offer and how much progress the mothers make in such a short amount of time. Getting to know the clients this week taught me so much about family and resilience. The mothers at Sheffield Place are striving to heal and give their children a better life. I loved working on the houses this week know they were going to loving and deserving families. This week at Sheffield Place has inspired me beyond my expectations. Sheffield Place is an incredible community, organization, and home that JMU was lucky enough to be a part of this past week. 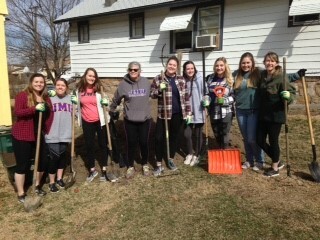 Throughout our time here, we cleaned up new Sheffield houses by moving furniture, raking, sweeping, and landscaping. Spending this week with the resilient women and their children who live here, has taught me the power and importance of having a healthy love, a healthy mind and a healthy life. As this week comes to a close, I am so grateful for this opportunity and I am inspired to recreate the love and cornerstone Sheffield Place radiates, in my own life at JMU. 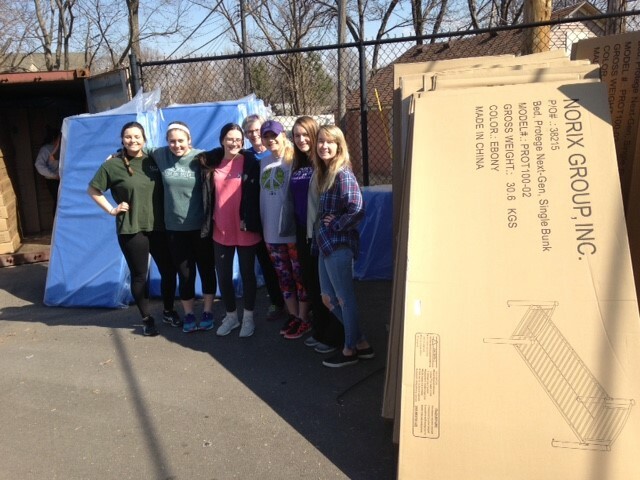 I couldn't have asked for a better way to spend my spring break than volunteering at Sheffield Place. As a college student at JMU it is typical for many students to head to the warm beaches of Daytona or Punta Canta for a crazy week, but after my experience at Sheffield Place I was not jealous of my peers whatsoever. The atmosphere here is so warm and inviting. Everyone supports and respects each other like family. Hearing the residents' stories were insightful and hopeful. I am so pleased to have helped build their homes and care for their children. Performing Sheffield Idol with the children especially made my week. They are all so talented, courageous, and supportive of each other. Sheffield Place is positively changing Kansas City one family at a time and I am greatful to have been apart of it. Inspiring, rewarding, positive, influential- all words to describe the amazing week of service I have had at Sheffield Place. 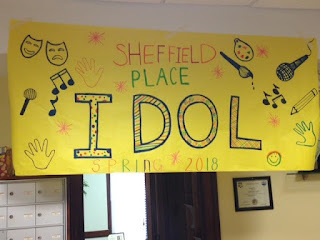 From starting off the week by playing with the children in Project Hope to finishing off the week by doing Sheffield Idol- a talent show for the kids to participate in- the entire week circled around the children and their mothers. I thoroughly enjoyed working with these children every day and getting to know their wonderful personalities and resilient strength, it made the week of service that much more worthwhile. Getting to hear the clients’ stories about what brought them to Sheffield Place and what they hope for the future was very influential and inspiring. We also worked on houses acquired by Sheffield Place to make them live able for mothers and their families to live in the for the future. I’m so excited that these families have a safe place of their own to turn to after they leave Sheffield Place. Overall, my week at Sheffield Place hasn’t even felt like service or work, it has felt like home and a loving community that has been a privilege to work with. I came into my week at Sheffield Place not knowing what to really expect but can confidently say that I am leaving with nothing but great memories. From the helpful guidance of the staff to the innocence and love of the children, I feel as if I am leaving a piece of my heart here in Kansas City. I am both humbled and grateful for the time I spent here with all the mothers and children. I saw true love, hard work, and a powerful sense of community amount these families. Thank you Sheffield Place for the good you put into the world. Our five days of service were jam packed with laughter, smiles, and growth. We had the opportunity to renovate homes, complete various projects, learn from the resilient mothers, and connect with the astonishing kids. 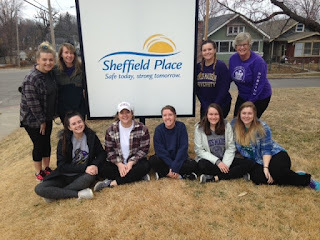 We were able to see all the services that Sheffield Place is able to provide to the population of mothers and their children experiencing homelessness in the Kansas City area. It is extremely apparent that Sheffield Place is a community. During the talent show, Sheffield Idol, many kids were nervous. The other children got up and sang with them, told them they believed in them, and exuded endless support. In this moment, the mothers were able to see their children perform, and their kids were able to just be kids. The love across the mothers, children, volunteers and staff has fostered a true family under the roof of Sheffield Place. Sheffield Place is truly a community and I saw that from the minute I walked in the door. Speaking with the clients was an eye opening experience and the hope that they had for the future filled me with joy. All the services that Sheffield Place provides for the families is unlike anything I’ve ever seen and I feel so privileged to have been a part of the Sheffield Place community for the week that I served there. It is very hard to put this week into words. To say that this experience has changed me is an understatement. I have learned more about myself and the world around me than I ever thought possible. I have learned about the strength and resilience of the human spirit. The families I was lucky enough to meet this week have taught me lessons that I will treasure. Their positivity, perseverance, and generosity continue to astonish me. My experience at Sheffield Place in these short five days has made me laugh, cry, and most importantly, reflect and be grateful. From working in the homes to hearing clients’, to Sheffield Place Idol, I will always be so appreciative of the love and respect I have gained from this incredible trip.